1.3. Configuration of "Compact or DSLR USB Camera (Gphoto2 PTP mode)"
1.4. Configuration of "USB webcam"
1.5. 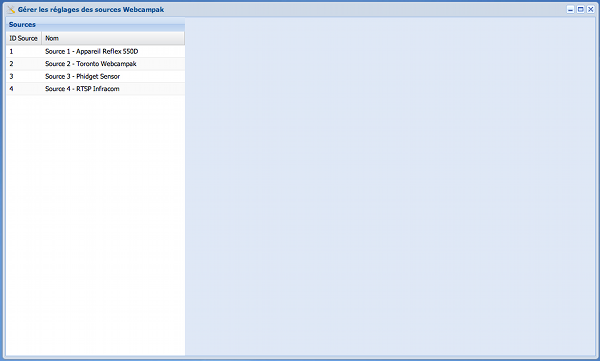 Configuration of "IP Camera (FTP) / Webcampak"
1.6. Configuration of "Internet Picture" or "Video Streaming"
1.7. Configuration of "Sensor (Phidget)"
Please note that Webcampak is provided preconfigured, you will therefore not have to perform most configuration settings mentionned in this part of the document. To configure Webcampak sources, click on "Sources" icon on the dashboard or go to "Webcampak Menu > Configuration > Sources". To begin configuration, select a source in the left portion of the window. Please not that each time you select a different source or a different tab, the system will reload settings so save your modifications before doing so. Capture: settings related to picture acquisition. Pictures: settings related to picture manipulation (right after successful capture). Videos: settings related to daily video creation. Custom Vids. : settings related to custom video creation. Post-prod Vids. : settings related to batch processing (apply a set of modifications to a large number of pictures). This tab contains all settings related to picture acquisition. This is probably one of the most important par of Webcampak configuration, you will use it to define how/where to capture pictures and at which frequency those pictures must be captured. This option defines if the source is active or not. An inactive source will not be processed by Webcampak (for pictures as well as videos). If you want to temporarily disable picture capture, use "Block capture" option available in this box. Choose this option is a DSLR (or compact) camera is connected to Webcampak USB port. Choose this option is a usb webcam is connected to Webcampak USB port. Choose this option is an IP Camera, another Webcampak, or a source from this same Webcampak is going to regularly send pictures to the current source inside /tmp/ directory. Webcampak will regularly scan this /tmp/ directory and will process pictures if available. If you plan to use a Webcampak source here, you will need to link to a "hotlink" picture, just ensure you hotlink definition is big enough for your needs. This option can be used to capture sensor values (those are not pictures) from Phidget boards. Each of the above source type has specific settings that can be configured in other sections of Capture tab. This is the option where you define the capture frequency, we advise you not to go below 10s when doing testing and not below 30s in a production environment (long lasting projects). Possible values are highly dependent of camera's configuration. Please note that if you want to use a frequency below 1 minute, you need to use a multiple of 60 (for example 10s, 15s, 20s, 30s). This option is mainly here for stability purposes, this is the minimum time between two pictures. Any request below will be blocked by the system. This option can be used to delay picture capture by a few seconds (or minutes). Note: This settings can be applied to any source type except IP Camera. This settings aims to define which date should be used when saving the picture, it can be either when capture request is initiated or when capture actually happens. For example, one of your sources (source 1) capture one picture per minute with the objective of creation a timelapse video, you would like to upload one picture every 5mn to your website (source 2), When you capture a source 1 picture from source 2 you want to ensure that capture is completed before initiating the capture, therefore you would implement a capture delay of a few seconds (20s for example), but real capture time of source 1 will be T and not T+20s, therefore if you select "Script start time" source 1 date and source 2 date/time will be identical. On the other hand, some specific usages might require very accurate dates, "capture time" will record date/time when picture was taken from camera. Select the timezone corresponding to your source location, this settings is particularly interesting when Webampak is located in a different timezone than its source. Use this option in case of capture issue, this option will disable automated log deletion. Do not use this option in a production environment. Enable this option to receive emails from Webcampak (capture error, stats, ...). Emails settings (destination email, SMTP server, ...) must have been configured properly for this feature to be operating. Use this option to disable capture while keeping the source activated. This is especially useful (and recommended) if you plan to perform multiple "Instant Captures". Capture calendar will let select which days and hours you want captured to be enabled. Those settings are useful in case multiple cameras are connected to one single Webcampak, otherwise default settings will be sufficient. To use multiple cameras, first activate the appropriate option is "Webcampak menu > Configuration > General", you will then need to specify Camera Model as detected by the system. Camera Port settings is only useful if you want to force capture on a particular port. Please note that camera ports change each time the camera is connected/disconnected. We strongly advise to selection "Automated" option here. If you use different cameras, the system can use camera name to associate a particular camera to a source. Copy in "Camera Model" the model exactly as it is detected by the system in "Webcampak menu > Configuration > Connected Devices". You need to mention "Canon EOS 550D" in Camera Model. Before each capture, Webcampak will look for cameras and ensure the proper camera is attached to the proper source. Then, choose a tag to be inserted within the camera (Camera Owner), this tag should be simple, with no special characters and no spaces (for example CAM01) and save the page. This will add the tag to the camera. Please note that this is a very advanced feature that might be compliant with some specific cameras only, this configuration must be done within our premises (or remotely assisted by our team as some debugging might be necessary). 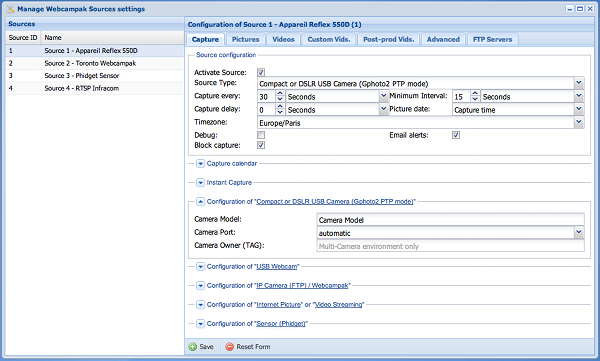 You can find all details about USB webcams in "Webcampak menu > Configuration > Connected Devices" section. This section can be used to configure how pictures coming from an IP camera or another Webcampak source should be processed. This section is useful to create cascaded sources and apply multiple manipulations to one single picture by moving it from sources to sources. EXIF Metadata, use this option to gather the date from EXIF Metadata, your camera's clock must be accurate. Select this option if you want to import an offline timelapse into Webcampak. This option is interesting when capture rate on the current source is slower than capture rate of the source sending the picture (mutiple pictures processed at each rotation). During a rotation, it migh happen that no pictures are available in /tmp/ directory (in case of network issue for example, or if Webcampak is suffering from a power outage). If you tick this option, an email alert will be sent and an error image will be generated. The situation is slightly different than a failed capture from a DSLR camera. An error in this particular situation could be caused by a network issue, and if the device taking initial shots is a Webcampak, it is very likely that pictures are still available (using Webcampak internal 230GB buffer). You will only have to upload pictures at a later stage. Webcampak can capture pictures coming from Internet or from a video stream. This section also makes possible to capture pictures from another Webcampak or another source from the same Webcampak. This is a very specific configuration module, it is not (yet) detailed in this document.